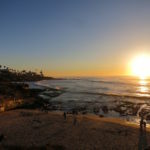 We recently spent a day and night in La Jolla, California. We’d like to thank the Grande Colonial Hotel, George’s at the Cove and the San Diego Tourism Authority for their help planning our trip. We were not paid for our reviews. All opinions reflect our own opinions and experiences. While visiting La Jolla we had the opportunity to dine at George’s at the Cove. George’s at the Cove has three levels. 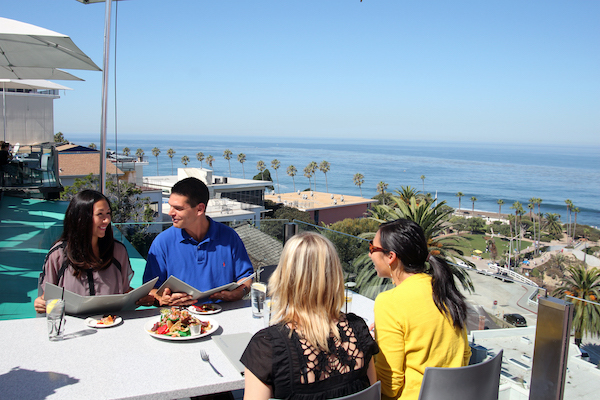 The casual rooftop Ocean Terrace offers a terrific view of La Jolla Cove and serves up lunch and dinner. Next, on the middle level is Level 2, which prepares special cocktails and offers a casual lunch and dinner menu. The lower level is home to California Modern, where we discovered an eclectic gourmet dinner menu designed to please every food traveler. If you wander to the restaurant downstairs you’ll want to order one of their unique hand-crafted cocktails as you ponder exactly how you’re going to choose what to order from this tasty menu. We were really impressed with their diverse cocktail and wine list. This is definitely a place to order a special cocktail. 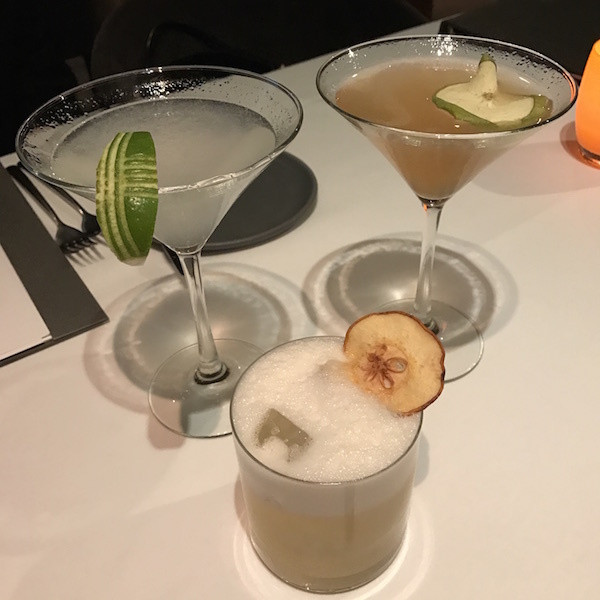 We had the Something with Pears made with local pear-infused gin, St. George Spiced Pear Liqueur, ginger, tea, lemon and cold smoked egg white (which I loved). We also sampled the Bad Apple with house rum blend, fresh citrus, house-made spiced apple butter and Pernod Absinthe Superieure, which was also delightfully refreshing. The menu is set up to order either ala carte, a four-course tasting menu or an eight-course tasting menu. Diana and I had the four-course tasting and Nancy, Diana’s Mom, decided to go ala carte. Chef Trey Fosse’s motto is serving up locally-sourced products and this is his idea of what San Diego would taste like. 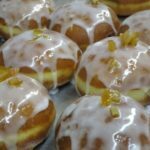 Through our tasting he really let us discover San Diego with his unique food creations. Since I love seafood, I focused on many of the local seafood dishes. 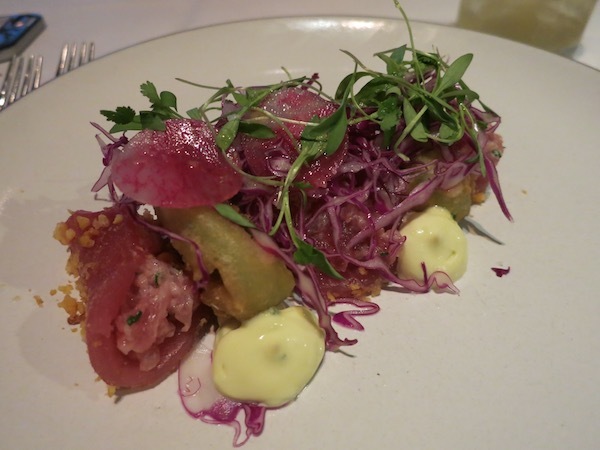 The “fish tacos” contained yellowfin tuna sliced into taco-like shells filled with tuna tartar. I could have made a meal just out of this dish alone. 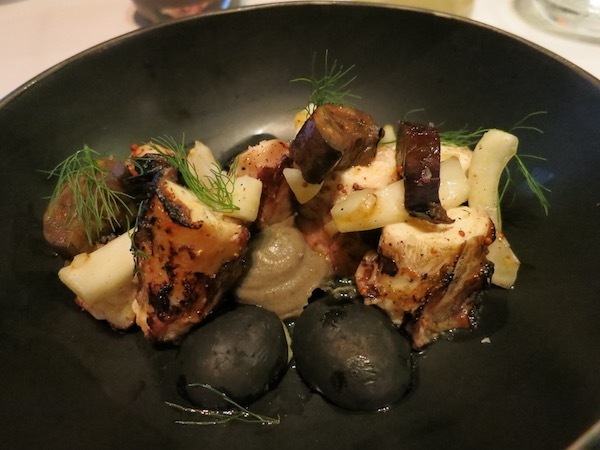 The grilled octopus with whole grain mustard vinaigrette included charred eggplant, fennel, roasted garlic squid ink potatoes. I love octopus and this was prepared just right with a rich smoky flavor and plenty of octopus. I really enjoyed the garlic squid ink potatoes too! Nancy decided to go veggie for the evening and George’s at the Cove certainly has many delicious vegetable choices on their menu. She started with the beet salad, with fresh cheese mousse, avocado, citrus, fennel and walnuts. Everything was fresh and tasty in this bright California-inspired salad. 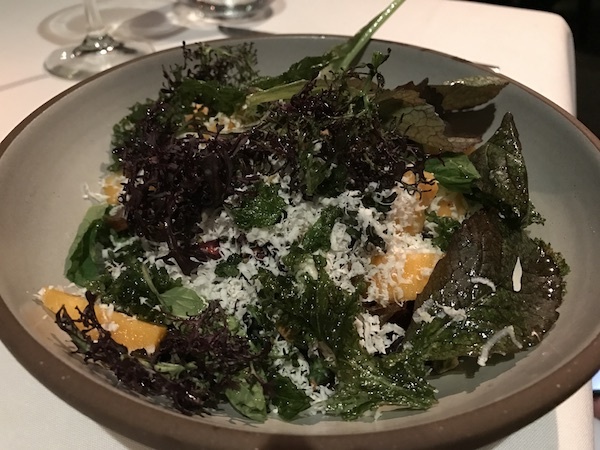 Diana had the salad with persimmons, brassicas, ricotta salata, local dates, buttermilk dressing, pistachio, mint and pomegranate. It struck just the right blend of tangy, savory and sweet with an excellent and satisfying combination of textures and tastes. Moving on, we tried the stinging nettle spaghetti with Chino Farms broccoli, broccoli pesto, aged cheddar and sourdough gremolata. 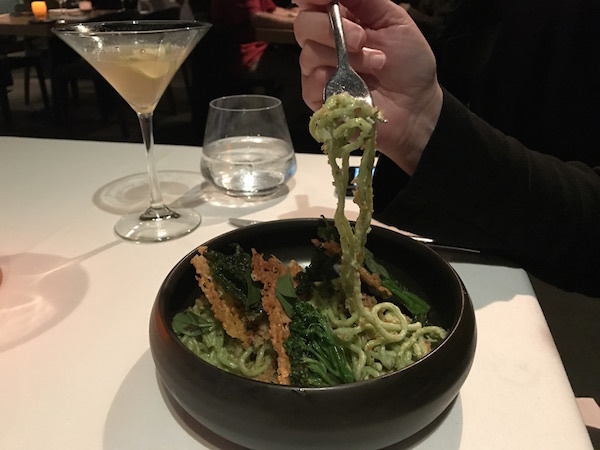 This unique dish with ingredients we hadn’t tasted before (have you tasted stinging nettle spaghetti yet?) left us wishing we had a second stomach. Although I was thoroughly enjoying the seafood dishes I really wanted to try some meat too, so I went with the red wine braised beef cheeks. This dish was just outstanding! 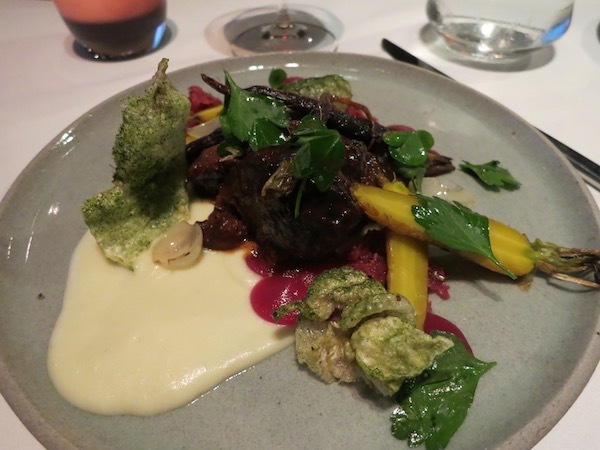 Everyone sampled the beef cheeks that seemed to melt in you mouth. 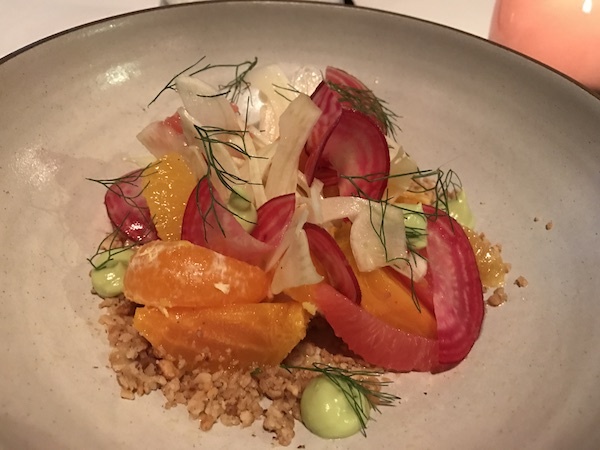 The well-balanced plate included potato-horseradish puree, pickled cabbage, puffed tendon, mustard seeds, carrots, spring onions and fine herbs. Again, I would return for this dish alone. The next veggie dish was so flavorful and robust it would make even meat-lovers jealous. 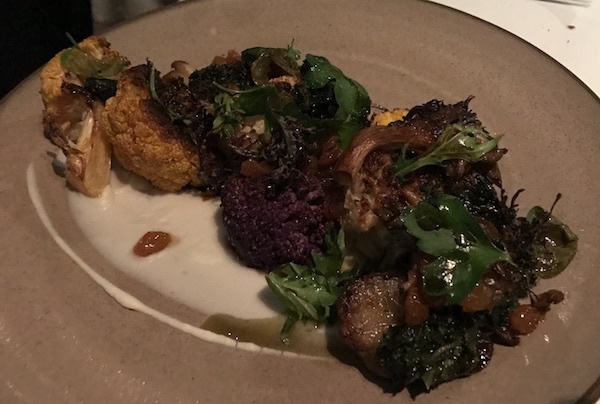 Roasted cauliflower with sunchokes, wood grilled Chino Farms vegetable top jam, wild mushrooms and Buddha’s hand in a caramelized vegetable demi-glace. If that sounds deeply satisfying to you, you wouldn’t be disappointed. The colorful plate was delicious and rewarding. 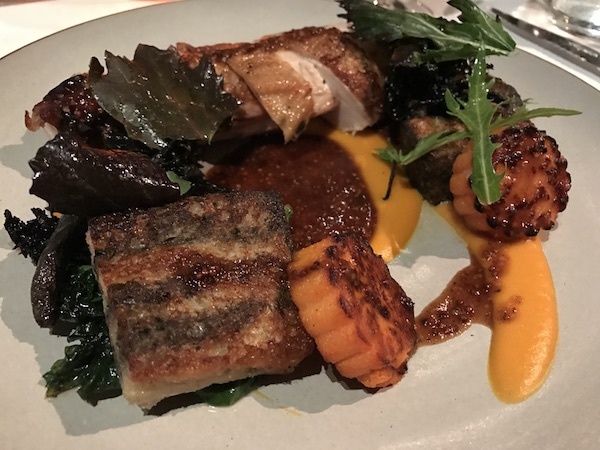 The roasted Jidori Chicken with black trumpet mushroom bread pudding, sweet potato and China Farms mustards was yet another perfect combination of flavors. 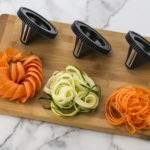 This tasty combination served to bring out the best of each element for a delightfully enjoyable dish. Although we were sufficiently sated, we simply couldn’t pass up dessert. We finished our wonderfully creative meal with the doughnuts and dips. 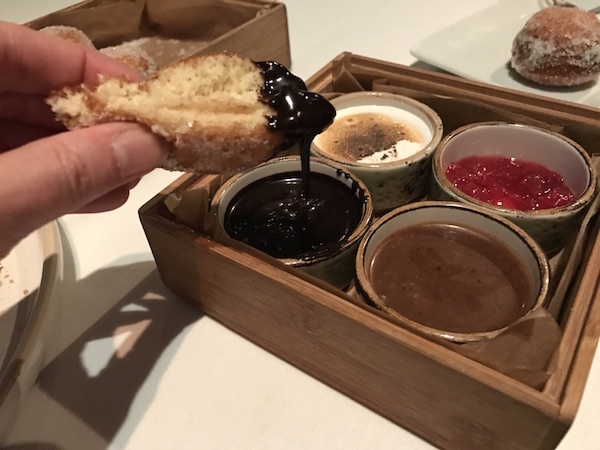 Fluffy little donuts with cranberry-pineapple, toasted marshmallow, salted chocolate and burnt cinnamon-caramel. Yes, they were as irresistible as they sound! 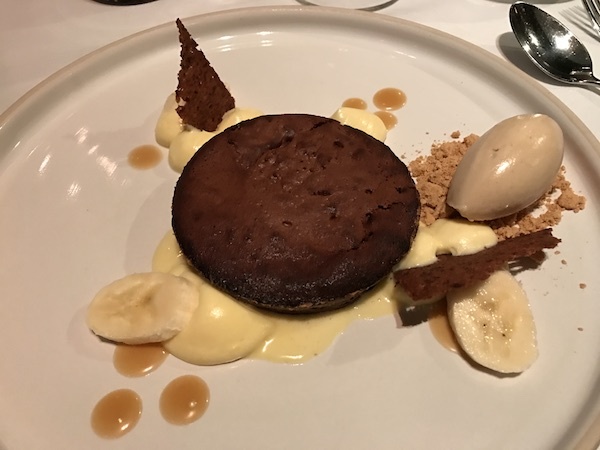 We also tried the warm chocolate tart with passionfruit, toasted banana bread and kinako ice cream. In this rich but not cloying combination of fruity, creamy, chocolatey heaven, the flavors burst in your mouth giving you a wonderful way to end to a remarkable meal. It was a spectacular food adventure from start to finish. We will say that we thought the portions were more than generous. We were quite full from our four-course tasting and might suggest going ala carte for light eaters. Even so, we certainly are more than happy that we got to try so many of Chef Trey Fosse’s wonderfully created dishes. If you find yourself in La Jolla you must stop in George’s at the Cove for lunch or dinner. We highly recommend you experience the unique locally-sourced California Modern cuisine Chef Fosse is serving up. Spending just 24 hours in La Jolla is such a tease. 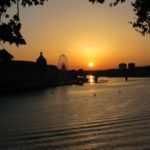 We know we’re going to return to enjoy the sun, sea and great food very soon! If you’d like to learn more about our adventures in La Jolla check out our post 24 Hours in La Jolla. 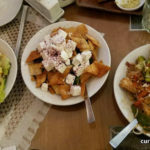 THE QUICK BITE: For an innovative, local, tasty meal, try George’s at the Cove in La Jolla, CA. I think I should make a point of only reading your posts when I’m sure to be eating soon. Everything at George’s looks amazing. No, I’ve never had stinging nettle spaghetti, but I’m eager to try. My fave dish in your pics is the roasted chicken – made my mouth water. La Jolla is a great place to be dining with a view, too. First, I would want to visit all three levels. Love great views. Cocktails would be fun and the food in the restaurant looked amazing. Those doughnuts and dips definitely caught my attention. Now I’m hungry. I used to go to San Diego several times a year to visit a friend. George’s in La Jolla is my favorite restaurant! I have to admit, I’ve never eaten on the deck — the view is gorgeous. I guess I’ll have to go back! Wowza! That menu at the Cove La Jolla looks pretty amazing. Especially that chocolate tart! I’ve been to San Diego, but I don’t recall the La Jolla area. Will have to bookmark this for my next visit. Cheers! I’ve heard before about George’s at the Cove and now am salivating for the next time I am in La Jolla and can dine there.